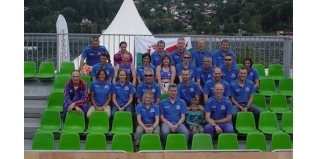 Chris Kitchen, GB Team Manager has kindly been in touch with an update from Gerardmer, France at the ETU European Long Distance Triathlon Championships. He's also provided what we think/hope is the position for the GB Age Group medals! The day was very wet and cold, and two French guys, Rouyer and Pernet were out of the swim first followed by Amey and Gambles about a minute down. Amey soon overhauled the leaders early on the tough mountainous three lap bike at one point pulling out a three minute lead. The cold however was getting to Amey, and whilst he came into transition in first place his lead had been eroded to 55 seconds over second place Gambles, with Reboul third some two minutes down.